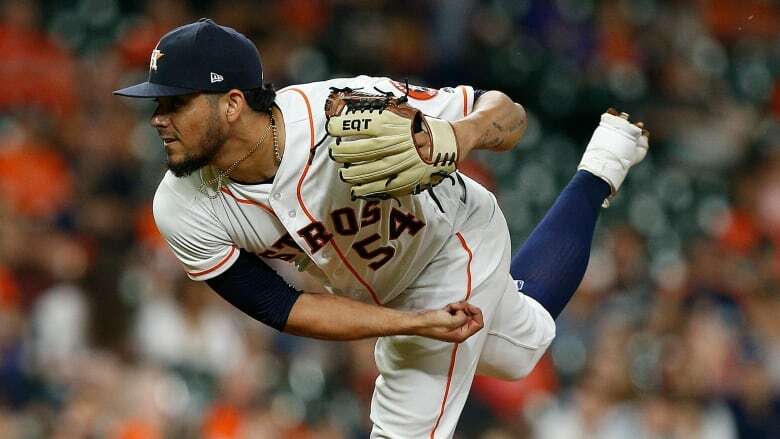 The Houston Astros are prepared to use recent trade acquisition Roberto Osuna as their primary closer for the remainder of the season, manager A.J. Hinch said on MLB Network Radio on Tuesday. The Astros have been utilizing Hector Rondon in that role since former closer Ken Giles was demoted to Triple-A prior to being sent to the Blue Jays as part of the Osuna deal. The Astros traded Giles and two minor-leaguers to Toronto on July 30 for Osuna, who was nearing the end of a 75-game suspension for violating MLB's domestic-violence policy at the time. The right-handed reliever was arrested May 8 and charged with assaulting his girlfriend in Toronto. Osuna pleaded not guilty and is next due in court on Sept. 5. His arrival in Houston received a muted reception, with teammates such as Justin Verlander, an outspoken critic of domestic violence, saying they would wait to pass judgment. The players held a closed-door meeting with Osuna after he joined the club. Osuna debuted for Houston on Aug. 7 and has made five appearances for the Astros, allowing one run on five hits and a walk in five innings. In 20 appearances this year, the 23-year-old has a 2.66 ERA with 16 strikeouts in 20 1/3 innings. "I wanted Hector to know that I'm gonna start to use more in the seventh and eighth, which means that Osuna's going to get the majority of save opportunities," Hinch said. "But I need to use him in creative ways, too. "I think you'll see that happen where Rondon gets some right matchups in the seventh and eighth, and Pressly will be somewhere in there, and McHugh will be somewhere in there, and Osuna will close the door, which is how this bullpen's built." Despite the expected change in approach, Hinch does not want to define his relievers' roles too precisely. Rondon, 30, is 2-2 with a 2.36 ERA with a team-high 13 saves in 48 appearances this season. Osuna will be eligible for the post-season, as players suspended for domestic violence are eligible to play in the playoffs, unlike those banned under MLB's policy prohibiting performance-enhancing drugs.